The village of Yegen is part of the municipality (local council administrative district) of Alpujarra de la Sierra which also includes the villages of Mecina Bombarón and Golco and the tiny hamlet of Montenegro. 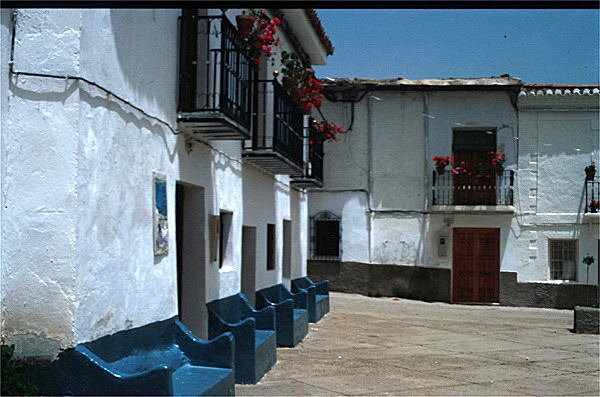 Mecina Bombarón was the home base of the King Abén Aboó, leader of the second Alpujarra rebellion and the last Moorish monarch to remain on Spanish soil. He was assassinated in 1571 when Phillip II brought to an end any further moorish revolt. Also in Mecina there is the supposed Puente Romano (Roman bridge) that crosses the river Mecina below the main road and forms part of the ancient ‘Camino Real’ that linked Almería with Granada. In Montenegro there is the delightful natural spring “The Gypsy’s Leap’ and a pretty capilla devoted to the Virgin Fátima. Golco contains one of the oldest churches in the region built on the foundations of an erstwhile mosque whose architectural features include rare examples of vaulting and plaster work. YEGEN is internationally well known as the first Spanish home of the English writer and hispanist Gerald Brenan; and is the subject of his most famous book ‘South from Granada’ which considers the culture, anthropology and history of the village as much as the author’s personal history of his stay there. Was born in 1894 into an English middle class family of military background. During his first 8 years he lived with his family in South Africa, Ireland and India. When he was 17 he ran away from home and walked with his friend and mentor John Hope-Johnstone to ‘somewhere in Bosnia’, some 2,500 kms! They were aiming for China! In the early 1920s, after serving in the First World War, Brenan moved himself and his belongings (mostly books) to Yegen, where he lived intermittently for many years, entertained leading members of the ‘Bloomsbury Set’ (including Lyton Strachey, Dora Carrington and Bertrand Russel), and fathered a daughter (Miranda) with Juliana a young woman from Yegen. Brenan married an American, Gamel Woolsey, and after the Second World War returned to live in Spain where he wrote other seminal works on the Peninsula; The Spanish Labyrinth, The Face of Spain, The Literature of the Spanish People are the most well known. This year has seen the screening of the first Spanish film related to Brenan. Directed by the respected and well known Fernando Colomo, the screenplay is based upon Jonathan Gathorne-Hardy’s biography, ‘The Interior Castle’ and focuses on the relationship between Brenan and the mother (Juliana from Yegen) of his only child Miranda. Brenan’s house in Yegen is still standing and bears a plaque commemorating his stay in the village.